This past Wednesday, I spoke with Kim Pacquin (General Manager), Brent Elison (Lead Game Designer), and Gemma Vince (Producer) from Nvizzio about Eden Rising: Supremacy. If you're unfamiliar, here's a gameplay trailer that shows off some of what the title is all about. One of the key aspects that's emphasized in that trailer, and was reiterated by the development team with whom I spoke, is the co-op. Up to eight players (that will go up to 16 when it formally launches) all join up on one server to form a "Tribe." The Tribe works together to explore the world of Eden, gather materials from enemies and the environment that are then used to craft armor, weapons, and defensive turrets, and then defend the "Crucibles" (which act as your bases of operation) against waves of foes in "Siege" events. Those Sieges are manually triggered by the players themselves and you'll be able to see what enemies will be attacking as well as where they're coming from so you can plan out and deploy your defenses before things get hectic. 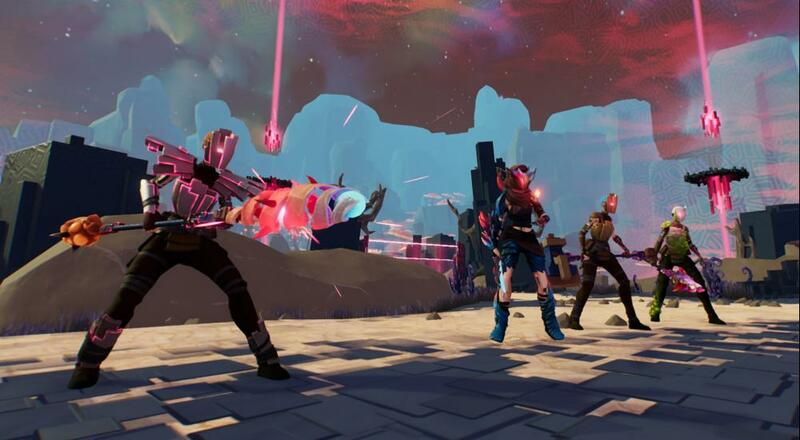 There are elements and mechanics from a number of genres and titles (such as MMOs, Orcs Must Die!, and even Monster Hunter), but they all come together in a package that certainly looks promising. The icing on the cake is that the team at Nvizzio have a very clear focus on making the game as cooperative as possible by allowing friends to freely to hop in and hop out whenever they want, while also ensuring there will always be something for them to do. I haven't had a chance to play the game myself, yet, but I was encouraged by a few things the team told me. First off, the server I mentioned previously is private. One player will create a game on a server hosted by Nvizzio, and then invite their friends to it. As it's being hosted by the developers, that server/game will be available to everyone that has been invited to it regardless if the "host" player is online and playing. This ensures not only that you'll be playing with the group of friends (and/or friends of friends) that you want, but also that they won't be limited in their playtime. The second thing that caught my interest was the mention of planned "world events" that will be introduced over the course of the Early Access period. While the exact details of these events were vague for now, some of the information that Brent shared indicated they would be a kind of alternative to the Siege events. This would provide players that are more interested in exploring the world and digging into its lore will have something to quench their particular thirst. The final thing we discussed that's piqued my interest is the "progression" system. There isn't any kind of player level, experience points, or skills into which you'll put points, rather, much like Monster Hunter, every player will be the same blank slate. The "role" that you wish to pursue (e.g., tank, DPS, support) will be determined by the equipment that you craft and equip. Armor, for instance, may certain have buffs or penalties that will support a particular build or playstyle. For example, "tanks" may opt for heavier armor that provides greater defense, but will also have "stamina" penalties that make it tougher for you to dodge away from enemy attacks. I really like this particular kind of progression system where players determine the build they want based on the equipment they wear as it allows for some very interesting hybrid possibilities. Oh, and Nvizzio is keeping this progression co-op friendly as well as any blueprints that are unlocked by one player in a Tribe are unlocked for the whole Tribe, and resources can be freely shared amongst players. While the game is not available for sale at the moment (that will happen once it formally enters Early Access), you can check out more of what the team has in store and add it to your Wishlist over on its Steam page. This is something I know I'll be watching as it progresses throughout its Early Access phase, and a game that we'll hopefully be able to share with you all soon during one of our regular Monday night "Let's Play Co-Op" streams. Page created in 1.4556 seconds.